King Press®, a division of Robertson Equipment Company Inc., based in Joplin Missouri, is an organization reborn from the original King Press Corporation. The origins of the King product line date back to the late 50’s at the beginning of the conversion from letter press’s to offset, and has evolved into a major player in the international press market. A work horse of the small newspaper and commercial printers, the Color King®, and News King®, where complemented in later years with the Process King®, and Print King IV®, and are considered by many to be among the finest single width, single round press lines manufactured to date. Over the years, Fairchild, White Consolidated, Solna Inc., Printer Equipment Corporation, were companies that owned the King product line. Even though these Corporations often attached their own name to the product line, King Press was the name that stood for many years. Sadly, King Press Inc. went up for auction in the summer of 2003. Robertson Equipment Company Incorporated acquired at auction, all intellectual properties, work in progress, parts room with tooling, as well as trade names and patents. Charles J. (Bob) Robertson III, president and owner, has taken on the sizable task of providing support for the entire King product line, from the earliest models manufactured, to current equipment in production. King Press® manufactures and remanufactures King equipment, a full line of replacement parts for the King line, as well as a variety of new auxiliary products. With our extensive manufacturing capacity, King Press® can provide the user with quality replacement parts manufactured with original specifications, at economical prices. Our goal at King Press® is to provide King users with the support necessary to assure continued reliability of their equipment. We hope that you, the user, will take full advantage of that support. We know that our success depends on your success. We look forward to supporting you in all your press needs. The late Charles (Bob) Robertson “Senior”, worked in the old down town section of Los Angeles California in the late 50’s with Orville Dutro. Their goal was to develop, blue print, and tool up Orville’s new invention, an offset printing press. Once the design had been developed, properly documented, and tooling built, Orville sold the product to a local Los Angeles company, the Waste King Corporation, who were known as one of the original, if not the first manufacturer of the garbage disposal. Waste King named their new product the Color King® and had plans to manufacture the new design. Born and raised in southern Mississippi, Senior had many humorous stories of the misdirection’s of those early years. With a smile, senior would tell the story of Waste Kings hurried up unveiling of their new product at the L.A. press show. One of the top executives, obviously not a printer, he would say, had a really nice sign made up for the prototype press they had just purchased from Dutro, above the press line the sign read, WASTE KINGS COLOR KING. Senior could hardly get to the end of the story without laughing about the reaction publishers and printers had as they came thru the show. Not long after the L.A. show, Waste King sold Dutro’s design, now called the Color King, to the Fairchild Corporation, a large diversified company anxious to get a jump start on the new offset technology. After Fairchild’s acquisition, Senior joined the Fairchild organization and moved his family to Joplin Missouri. In Joplin he helped set up Fairchild’s new manufacturing facility for the Color King press, at the13th & Maiden Lane Joplin Mo. location. Once the new factory was up and running, he was tasked with managing the design, development and tooling of the News King® press, which would round out the King product line with a vertical web printing unit. 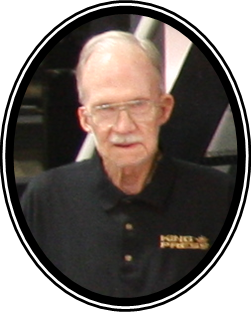 Senior served as Chief Engineer, Vice-President for many years and initiated many improvements to the King Product line. King Press Inc./ PEC Corporation closed a few years after Senior’s retirement. Senior lived to see the King Press® factory brought back to life at its original 13th and Maiden lane Joplin Mo. location.